parkrun is a gift that keeps on giving, and over 250 weekends has offered me significantly enhanced wellbeing in an increasingly connected community. As I pass a parkrun milestone – or should I say kilometre stone(?!) – the chance of some modest reflection cannot be missed. This is a potted history of the seven-year journey humps, bumps and all. Colin, my running buddy suggested we try this new thing; “parkrun”?, a timed 5k, starting in Milton Country Park; a five-acre wilderness oasis in suburban Cambridge, with two miles of pathways, lakes, woodland and a café; great parkrun credentials. On the Saturday a blanket of snow and ice covered the park. My partner suggested I was mad; running in this! It was sure to be cancelled. At 9am, 71 parkrunners turned up for this inaugural event. It’s regularly around 500 nowadays; marshalled by a bullhorn wielding volunteer! Little did I know there would be many more inaugurals, birthdays and of course regular parkruns ahead. I thought afterwards ‘this is good, but no way will I be doing this every week’! I did not realise however I had started contracting Obsessive parkrun Order (OpO), well it can’t be a disorder, right? Even though I had no idea what OpO was: yet! All four of us moved from UK to Dublin – lock, stock and barrel – in late 2011. Weighing up the massive move decision balance sheet was tough. The liabilities list had for some reason; no parkruns in the Republic of Ireland! What’s that all about? I suspected the recession may have been something to do with it. The Celtic tiger was hunted to extinction and taxidermied around then. However the overall balance sheet was healthy e.g. egg and onion sandwiches available, long vanished in UK (literally distasteful), were on asset list. So I tried, slightly desperately to reach the 50 parkrun milestone, before departing to a land barn of parkruns! Fortunately the wilderness years, should I say gap year, turned out to be a solitary one. Landing in our new world; well Dublin ferry port in September 11, I had notched up 46 parkruns; tantalisingly close to attaining a red 50 Club shirt. This raised my OpO to scarlet fever pitch, I needed an antidote. The cure: I and sometimes my red eyed family, drove, in the dark from Dublin to Belfast, at the crack of dawn, to parkrun. These turned out to be great adventure days out, although at 6.30am it did not! This culminated in my 50th parkrun on Christmas Eve 2011, what a nice festive gift. Joined by my mum and daughter, we also managed to sign the peace wall while taking a cab tour with “Fra” the same day. Dark clouds of ‘no more parkrun’ surrounded the dawn of 2012; now what? Fortunately there was a silver lining; Dun Laoghaire Pier Running (DLPR) a newly formed, social network running group. DLPR is part of meetup.com;’getting together with real people in real life’. Typically running 10K (two parkruns!) on a Saturday morning at 10am, along the gorgeous Killiney/Dalkey bay coast, a sort of ‘Searun’. This is followed by coffee (maybe some cake too), sparkling conversation and lashings of humour. What a fab group, which make running together fun and a bedrock of many running adventures. 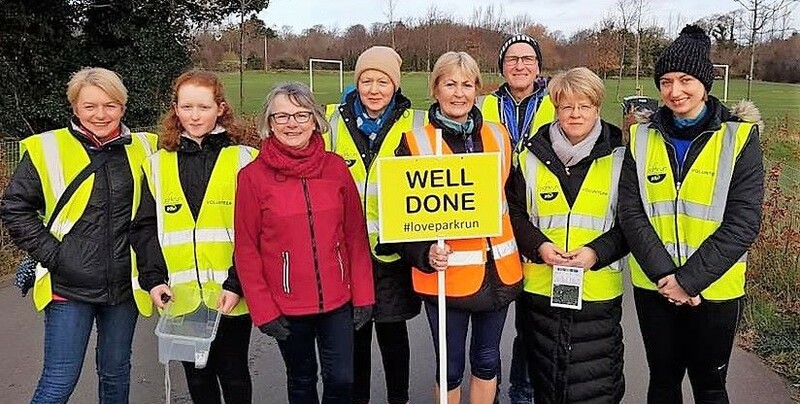 act together and ran the fifth Malahide parkrun in December. Realistically Malahide was too far away to become a regular Saturday morning fixture. It was more an occasional, novelty treat with strawberry pavlova in the castle after; another tough PR finish. 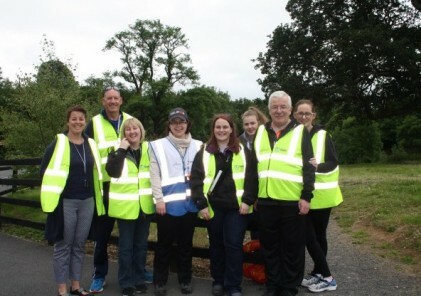 Then a solely pleasant surprise occurred when the superb, nearby Marley Park, began hosting parkrun in March 2013. Unfortunately this meant DLPR or PR on a Saturday morning; another tough decision; fortunately a midweek DLPR (mDLPR) session had just started on Tuesday evenings, this meant I could have it all; PR Saturday @9.30, DLPR afters (coffee+) @11ish and mDLPR run on Tuesday. I could have my cake and eat it, almost literally. Marlay parkrun became my second parkrun home. I was torn between a keen desire to volunteer and parkrun towards the black 100 Club shirt I was now eyeing enthusiastically. My first volunteer was lead bike at Marlay, what a spectacle as 800-ish parkrunners massed in front of Marlay house (the original course start point, when asked by my young daughters how the house got its name, I’d tell them “Bob Marley used to lived there”). Then like a Zulu style human wave charged; swarming across the open grass expanse, fully enthused; quite intimidating while invigorating. It was not long until the Black Tee was attained. Meanwhile my PB had stubbornly stayed at 24:23 since 14 Aug 2010, after trying all sorts of preparations and motivations. parkrun growth exploded during 2015 in Ireland, in south Dublin this meant another inaugural parkrun, in my backyard at Cabinteely in March; perfect. This parkrun is not too small, not too big, just the right size; its the ‘Goldilocks’ parkrun. Perhaps I’m biased, why not try it and see what you think? It’s also the toughest parkrun I’ve done, all up or down hill with a brief flat between. Cabinteely is collection of parks within a park; ponds, meadows, flower beds a forest of redwoods capped with a grandiose House. I realised I could volunteer and run (eg setup/clear down). Another little crinkle ironed out – and a purple club tee attained; my favourite club. The team at Cabinteely are lovely and we have loads of laughs. Molly the Collie often brings me along when she is doing a pakrun. This became my third parkrun home and the green (my favourite colour) 250 club tee arrived. So now ‘nothing’s missing’ what next? In the short term my 100th Cabinteely parkrun is in sight. In the medium after taking around seven years to complete 250 parkruns, health permitting the next 250 should take less due to the international abundance of parkruns along with chronic OpO, which I hope and think shall effect me for life as it has affected me for the last seven years. In the long term; maybe I should bring parkrun home to my home town of Coatbridge in Scotland, maybe I should work towards being a run director, or maybe I should enjoy the parkrun journey, live in the Saturday moment and be surprised by the next destination. What a great journey; a pleasure, a passion. Thank you to the parkrun community!